and they had a stage reading of it at the Teatro de Esperanza. Senties, the daughter of Mrs. Raquel Valle Tierros and the late Daniel Valle Tierros, was born and raised in Laredo. She is the mother of five sons and the grandmother of five. Senties is a writer, poet and artist. Currently she is painting a series of Chicana writers that she hopes to exhibit next year. She has a published collection of poetry, Soy Como Soy y Que, which won the Jose Fuentes Mares Literature Prize awarded by the Universidad Autonoma de Ciudad Juarez, Chihuahua. “When I won, it was the 12th year they had given out the prize, and for the first time in 12 years women won,” Senties said. She has also been published in numerous magazines in the U.S. and Mexico. In 1999 she was chosen Writer of the Year in Nuevo Laredo by Taller de Arte Renacimiento, a group of witers. Senties said she is looking forward to seeing her plays on stage at the Laredo Little Theater. The two productions are being performed at the same time with intermission between each one. 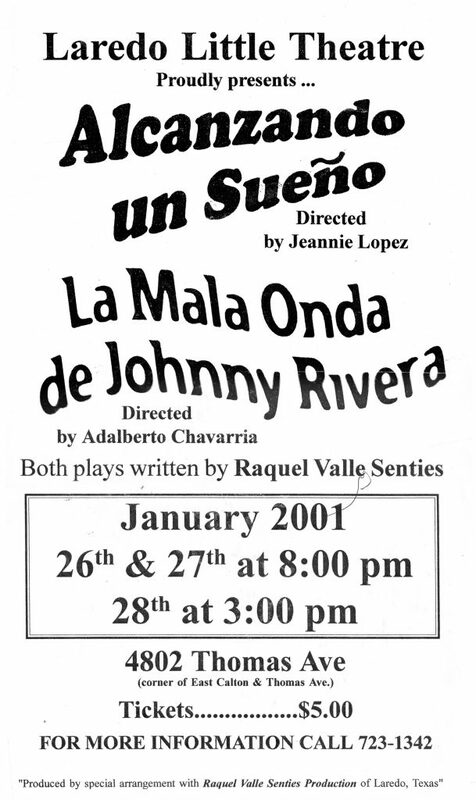 Jeannie Lopez, 2000 Director of the Year, is directing Alcanzando Suetio and Adalberto Chavarria is directing La Mala Onda De Johnny Rivera. Opening night , is Friday, Jan. 26 at 8 p.m. Other showtimes are Saturday, Jan. 27 at 8 p.m. and Sunday, Jan. 28 at 3 p.m. Tickets are $5 for all seats and will be sold at the door.